Learn all about banana nutrition and how beneficial they are for your health! See How the Benefits of Banana Nutrition Can Impact Your Life! When you want a burst of energy, banana nutrition in fruit smoothie recipes will rev your body engines into overdrive. The value of banana nutrition has sometimes been overlooked, but this is a fruit that needs to be in your diet. If you want to improve your health and that of your family, do not underestimate the benefits of bananas. This simple, but elegant treat can satisfy your sweet tooth, give you the fuel needed for a busy day, and add essential nutrients to your body with ease. One of the reasons that so many people enjoy this creamy, sweet fruit is because it is aromatic and delicious. There are some other good reasons that this appealing food is such a wide-spread favorite. The banana is very portable. It comes with its own wrapper. It needs no refrigeration or special care. One small serving is a healthy way to quench your hunger pains quickly. 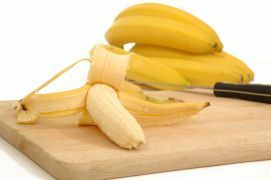 You can eat bananas fresh or frozen, include them in many fruit smoothie recipes, bake them into breads, or enjoy them dried. People have become aware of how important potassium rich foods are in a diet. Banana nutrition experts point out that this food contains more than 460 milligrams of potassium and only 1 milligram of sodium. Eating this fruit is one of the tastier ways that athletes can quickly replace the potassium they have lost due to sweat and exertion. Potassium rich foods have also been shown to protect people from high blood pressure problems, strokes, and hardening of the arteries. Scientists and nutritionists are educating more of their clients about the need for adequate potassium in a diet. This mineral is essential if someone wants to maintain a healthy heart and circulatory system. A rich supply of potassium however, is only one of the many benefits of bananas that this fruit makes available to each of us. Eating a small banana can counter high levels of acids that may be in the stomach. It can do this by creating an antacid effect. Research has shown that eating fresh bananas is a good way to lower the risk of developing stomach ulcers. The fruit may even help heal damaged lining that may already be present in the stomach. The banana causes the cells in the lining of the stomach to secrete more mucus. This thick mucus functions as a barrier as the banana releases other substances that help rid the stomach of the bacteria that is linked to ulcer formation. If diarrhea, constipation or irritable bowels are a problem, bananas can also help you. Eating bananas will help keep the body’s store of magnesium and potassium in check. This sweet fruit also assists your digestion and elimination systems by adding fiber and bulk to your intestinal tract. The pectin in the fruit is a water soluble type of fiber that helps regulate and normalize bowel function and activity. When you add a banana to a smoothie in the morning and evening you will be giving your body plenty of powerful nutrients. The benefits of bananas include antioxidants, phenols, vitamins and minerals which are all necessary for optimal health. It may not seem like it but these compounds can give you a healthier body, stronger bones, smoother skin and better eyesight. In fact an increased amount of fruit in a diet has been shown to offer protection against some forms of eye disease. Your body is able to build stronger bones because the bananas increase the absorption of calcium. This healthy fruit also contains an abundant supply of fructooligosaccharide. This is a sugar compound that ferments during digestion. The fermentation of the fructooligosaccharide leads to higher levels of probiotic bacteria in the gut which are good for you. Adding banana nutrition to the diet also helps cleanse the digestion tract as it moves waste along quickly. This efficient process lowers a person’s risk of developing colon cancer and is another one of the benefits of bananas. Want the benefits of bananas but can't grow them in your yard? Try growing a Paw Paw! They have similar fruit like bananas and can grow in colder climates. Get more info on Paw Paws Here! Make delicious banana smoothies! They make that sweet creamy base everyone loves. If you don’t want to use ice in the smoothie, a frozen banana works very well to chill your drink. Make sure that you use bananas that are ripe. If they have any green on them, they aren’t ready yet. Let them ripen on the counter. They should be starting to get brown spots on the skin. That is when their sugar content is the highest, which makes a sweeter smoothie. And who doesn’t want that? I personally can go through 2-4 bananas a day just for my smoothies. I have learned a valuable secret to save money while buying bananas. Buy bananas that are already very ripe. That is the time you want to use them anyways. They are usually developing brown spots on the skin. The banana nutrition remains unchanged. You can store them in brown paper bags in the refrigerator or freeze the crushed fruit for future use.